Congressman David Rivera, R-FL (aka “The Gangster”), still won’t resign while under FBI investigation for funding a sham candidate and facing eleven ethics charges. Proving that Florida is the fetid swamp where political rectitude goes to decay and die a foul death, Congressman David Rivera (R-FL) has raised the bar for misdeeds in office without resigning in disgrace. Justin Lamar Sternad, whose failed congressional campaign became the subject of a federal grand-jury investigation, has told the FBI that U.S. Rep. David Rivera was secretly behind his run for office, The Miami Herald and El Nuevo Herald have learned. Sternad, 35, also told authorities that his campaign manager, Ana Sol Alliegro, acted as the conduit between the campaign and Rivera, who allegedly steered unreported cash to the Democrat’s campaign, according to sources familiar with the investigation and records shared with The Herald. 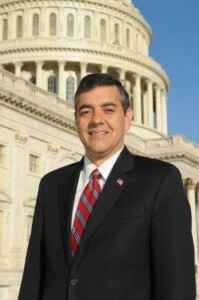 Bracing for embattled U.S. Rep. David Rivera to be indicted or lose his election, Republicans have started lining up potential successors to regain the seat in 2014 if the congressman’s Democrat opponent defeats him in November. Yup, Rivera is so toxic politically that he can’t even show his face when his closest political ally and the Republican nominee for President are holding a rally in his own district. Even in the face of that reality, Rivera still has not resigned. Already facing FBI probes and a daunting reelection, U.S. Rep. David Rivera was charged Wednesday by state authorities with 11 counts of violating ethics laws for filing bogus financial disclosure forms, misusing campaign funds and concealing a $1 million consulting contract with a Miami gambling business while serving in the state Legislature. Investigators with the Florida Commission on Ethics found that Rivera’s secret deal to work as a political consultant for the Magic City Casino — formerly the Flagler Dog Track — created a conflict of interest for the lawmaker. The ethics panel also found that the Republican broke state ethics laws by failing to fully disclose his finances from 2005 to 2009. Rivera signed a consulting contract with the Magic City Casino’s owners in 2006 to run a campaign to win voter approval for slot machines at Miami-Dade pari-mutuels. But Rivera had the money from the deal sent to Millennium Marketing, a company founded by his mother and godmother, records show. Rivera then received at least $132,000 back from Millennium — money that Rivera has called loans that did not have to be disclosed. At least even Republican polls are indicating that Rivera will lose his race by about ten points, so it appears that the voters in Rivera’s district are paying attention. It will be very interesting to see how Rivera reacts once he has been voted out of office and is facing potential criminal charges. Will he turn on his former colleagues? What nuggets could he offer in return for lesser charges? Oh no, that could totally happen here too. If the people who put you in power tell you to stay, you stay. These people are just trained lackeys and do what they are told. That is why they stay even when they are completely exposed as frauds, liars, and cheats. Of course not having morals or ethics is why they were selected to “represent” us by their Party in the first place. We’ve got a congressional candidate–Able Maldonado–out here on the Left Coast who’s suddenly spending bunches of Rovian money who has serious court issues with the IRS about $3.6 million of back taxes the IRS says he owes. Just got into more trouble because he wrote off $3,686.03 of business “entertainment” expenses…except the little party raised $35,000 in campaign funds. Oops. But it’s all good, see, because, according to Maldonado, “Despite what is being said on dishonest TV ads, the IRS isn’t suing me, I’m suing the IRS.” OK then. That clears that up. Plus he’s a Republican, so, you know, he’s OK and just being unfairly persecuted. Didn’t Jack go to jail for same? Where is the invisible suit for Chiquita platano?